Over 1000 more schoolchildren in the South West will receive cricket coaching due to a major partnership between Gloucestershire Cricket Board (GCB) and Mezze Restaurants. The sponsorship agreement will allow the GCB’s qualified coaches to educate pupils in an additional 20 primary and secondary schools across the county. The project officially launched at the NatWestT20 Blast match between Gloucestershire and Somerset on May 16, at the Bristol County Ground. Mezze Managing Director, Alex Tryfonos, said: “Earlier this year we offered a coaching programme to 12 schools across Bristol and North Somerset. Alex added: “With soaring UK child obesity rates suggesting one-fifth of children in reception and a third in the final year of primary school are obese or overweight, it is important that children become more active. The GCB currently delivers cricket coaching to more than 150 primary, secondary and special schools across Bristol and Gloucestershire. Coaches typically deliver blocks of six to eight weeks with sessions in both curriculum time and as after-school clubs. The new cash injection from Mezze – one of the region’s leading restaurants groups – will help them achieve their aim of coaching 10,000 pupils in 2015. GCB Chief Executive Steve Silk said: “Our school coaching is the lifeblood of our work to grow and develop cricket in Gloucestershire. “The partnership with Mezze Restaurants will not only allow us to reach more than 1000 additional children a year, it will also enable us to improve our education programme by providing information on healthy living. 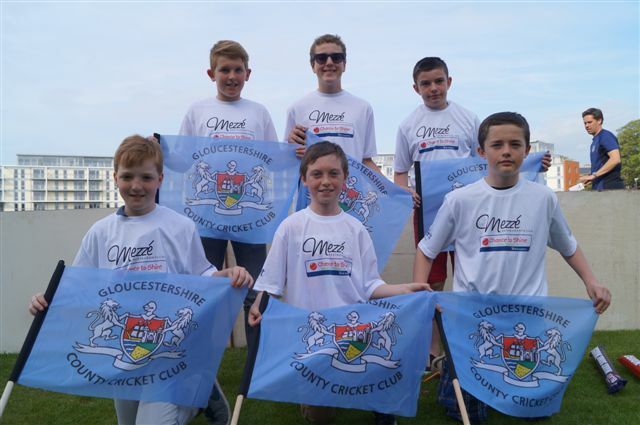 As well as the schools coaching the agreement with Mezze includes the chance for youngsters to be flag-bearers and mascots at all of Gloucestershire’s home NatWest T20 Blast matches. They will also sponsor Glos spinner Tom Smith. MEZZE Restaurants is offering schools and colleges across the South West the chance to benefit from £12,000 worth of professional cricket coaching to aid student development. The restaurant chain supports both community projects and charities and has decided to further extend its outreach projects to schools across the region. It will donate £1,000 worth of professional cricket coaching to 12 schools or colleges across Bristol and North Somerset as part of a link up project. Mezze Director Alex Tryfonos, a full Marylebone Cricket Club member (MCC) and team player for Bedminster Cricket Club, is keen to develop aspiring cricketers. Alex said: “Mezze is keen to support community projects and already offers an apprentice scheme in conjunction with St Katharine’s Catering College in Pill. “We would like to further extend our links with schools and colleges to support youth development by offering 12 educational establishments £1,000 each worth of coaching. “This will be led by English Cricketer Rob Cunliffe, who is an enormously talented right-handed batsman and sharp fielder. “During his nine years in first-class cricket he played for Gloucestershire and Leicestershire, as well as playing in six Youth Test matches for England in 1993. “Having retired from first-class cricket in 2003 Rob is now a full time cricket coach and plays in Bedminster first team and is the senior coach within the club.